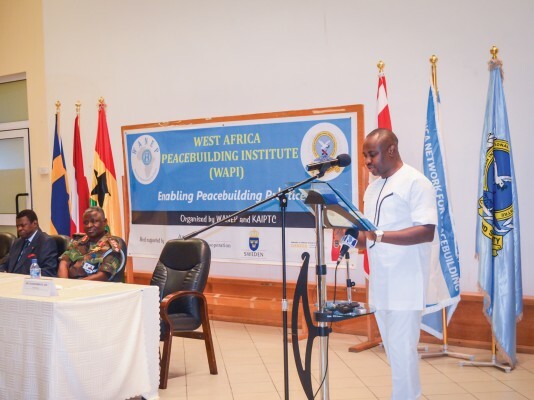 Emmanuel Bombande, MA ’02 (front, fourth from right), is flanked by his successor, Chukwuemeka Eze (black jacket), and Kwesi Ahwoi, then Ghana’s interior minister, at the opening of WAPI 2013 at the Kofi Annan International Peacekeeping Training Centre in Accra. John Katunga Murhula, MA ’05, is on the far left of the photo. The news coming out of Burkina Faso worried Emmanuel Bombande, MA ’02, in late October 2014 as he boarded a flight for Europe. For months, the West Africa Network for Peacebuilding (WANEP) – led by Bombande as executive director for 11 years – had been warning that Burkina Faso sat teetering at the edge of chaos. Would the country’s long-serving president try to cling to power by amending the constitution? Or would he respect the term limits placed on his presidency and step down? The current political context in Burkina Faso is a cause for concern to WANEP and other [civil society organizations] in the region and beyond. Tensions around constitutional amendments and transitions, political intolerance, identity-based politics as well as a lack of institutions for managing grievances [are] evident in the run-up to the elections. As the months went by, the political situation continued to deteriorate. Moderate voices began to say outrageous things. WANEP staff in the country began to fear for their safety. 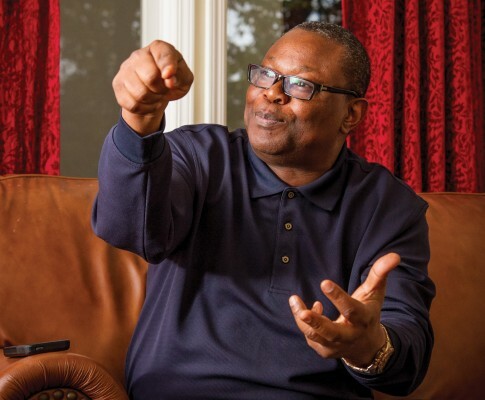 As Bombande traveled to Bruges, Belgium, for a meeting at the United Nations University, his heart remained behind in Africa, where tensions in Burkina Faso were heading toward explosive. He was constantly checking the news. As the meeting in Belgium began in the morning, Bombande’s Twitter feed began to confirm his fears. A crowd had gathered at the parliament building in the capital, Ouagadougou. By the first coffee break, the situation had worsened: parliament was in flames and the military appeared to have seized power. “The whole country was on the brink of total disaster,” he recalls. The crisis in Burkina Faso was following a depressingly familiar script. President Blaise Compaoré had first come to power through a military coup in 1987. Four years later, he won election as the country’s president. Compaoré went on to serve four terms as president, despite a constitutional amendment in 2000 setting a two-term limit. He circumvented this with a friendly ruling that the term limit could not be applied retroactively. Even by that generous interpretation of the rules, though, Compaoré would not have been eligible to run again for president in 2015 – unless the constitution were to be amended again. That’s exactly what Compaoré tried to do, and that was the matter being debated in parliament when the mob set fire to the building, as Bombande followed along in horror on Twitter. The following day, Compaoré resigned his office and fled the country, leaving an officer from his presidential guard in apparent control. The regional implications were also troubling to Bombande. With violent extremism spreading throughout the Sahel – Mali, northern Nigeria, Chad, Niger – another collapsed state would have afforded extremism with another power vacuum to fill. A period of instability could prove disastrous for other countries in the region…, already enmeshed in various levels of insecurity…. Burkina Faso’s political instability could provide more grounds for widespread insurgencies and rapid deterioration of human security in the region.… The huge presence of unemployed youths and small arms proliferation in a region with a history of civil wars provide a fertile recruiting ground for extremists. This sort of policy brief lies at the heart of one of WANEP’s core missions in West Africa: the coordination of an early warning and response network for conflict. The network is an early example of the ways WANEP co-founders Bombande and Sam Gbaydee Doe, MA ’98, worked to translate peacebuilding theory into on-the-ground results in a part of the world ravaged time and again by brutal wars. “Both of us who played a leading role in the founding of WANEP also found ourselves at EMU precisely because of its practice orientation,” recalls Bombande. “One of the things we have repeated and repeated is that at EMU it was not just knowledge and theory, it was its practice orientation. In the theoretical sense, an early warning and response network is a set of processes and mechanisms by which people, organizations and governments can anticipate, identify and quickly respond to small conflicts before they escalate into bigger ones. As put into practice by WANEP, the structure is built on people across the region trained to monitor conditions and issues affecting them and their neighbors. There are now more than 260 of these monitors spread throughout the region (eight of them in Burkina Faso). They read the local papers, listen to the radio, follow the gossip at the market, and chat with their neighbors. Many of these monitors also maintain their own sub-networks of monitors who represent the entire community – men and women, young and old, members of whatever different ethnic and religious groups are present. 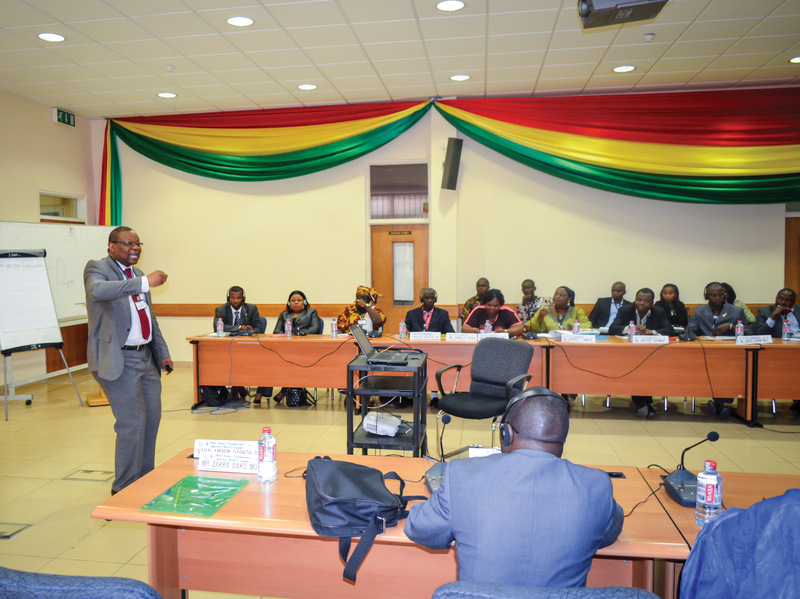 WANEP runs this early warning network in partnership with ECOWAS, an intergovernmental organization made up of 15 West African nations. The network (formally called ECOWARN) is run out of the ECOWAS Commission headquarters in Abuja, Nigeria, where WANEP’s liaison office to ECOWAS is located. Using a detailed, web-based reporting template, the network’s monitors regularly report on points of friction within their communities. Suppose an argument over politics turns ugly in the market. The monitor in the area would send a report up the chain to the WANEP national office, which then passes all reports it receives to the liaison office and the ECOWARN situation room in Nigeria. Collectively, patterns can emerge and nascent problems can be identified before they turn into big and very unpleasant surprises. The result: documents like the policy brief on Burkina Faso that warned of a deteriorating political situation seven months before the crisis came to a head. That policy brief alone wasn’t enough to avert violent conflict altogether. Tens of thousands of protesters battled police in the streets of Ouagadougou, parliament was set on fire, a dozen people were reported killed, and a military officer briefly appointed himself the head of state. But the response, informed by the early warning system, was both quick and focused. “Because of the prior work that had been done – with all the analysis, the early warning, the policy brief and the advocacy – what was significantly different in this situation was that [the response] did not take even hours. It did not take a full day. The entire region knew exactly what needed to be done,” recalls Bombande, who returned from Belgium several days later and plunged into the response effort. And it worked – by mid-November, the former Burkinabé ambassador to the United Nations was sworn in as the country’s transitional president. Full elections had been scheduled for October 2015. After two tense weeks, Bombande began to relax. The system bent, but it didn’t break. Violence broke out, but it was quickly contained. “We could have been talking about thousands of deaths,” says Bombande. “And we could have been talking about chaos on a regional scale. 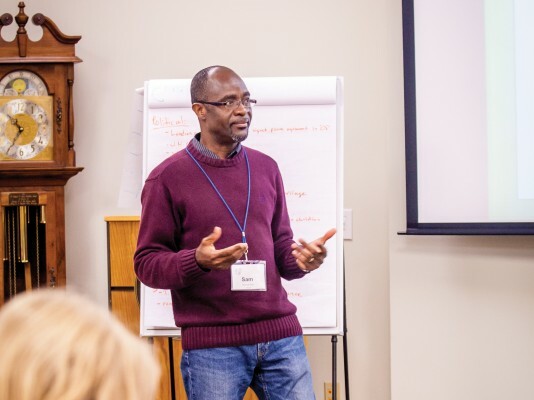 In 1998, after becoming one of the first students to earn a master’s degree from EMU’s Center for Justice and Peacebuilding, Sam Gbaydee Doe “left EMU fired up to translate a dream into a reality,” he told Peacebuilder in 2010. “I dreamed of a regional movement of civil society that would collaborate with regional intergovernmental bodies to restore not just stability in Africa but democratic freedom and prosperity,” said Doe, who is from Liberia. Back in West Africa, he connected with Bombande, who had recently been working on mediation of tribal conflicts in his native Ghana (and who went on to earn a master’s degree from CJP in 2002). Together, the two men founded the West Africa Network for Peacebuilding, or WANEP, in late 1998. The group’s first operating funds came from a $200,000 grant from the now-closed Winston Foundation for International Peace. One of the earliest programs of WANEP was aimed at women. In 1999, WANEP set up the Women in Peacebuilding Network (WIPNET). Doe had met a fellow Liberian, Leymah Gbowee, in whom he saw leadership potential in the face of a war that had decimated their country for more than a decade. As a result, WANEP hired Gbowee as its WIPNET representative in Liberia. By 2000, WANEP had an annual budget of $1.2 million and 300 member groups from 14 West African countries. “The profound thing was the speed at which ordinary people mobilized for peace,” Doe told Peacebuilder. As interest in the new initiative grew quickly, however, the region’s peacebuilding needs became apparent. “We immediately discovered that there was a huge void in West Africa when you talked about knowledge, skills, capacity in conflict prevention and peacebuilding,” recalls Bombande. To begin filling that void, Doe and Bombande organized a series of practical peacebuilding skills trainings in the region – including larger events in both English- and French-speaking West Africa. Among the leaders were colleagues of Doe’s and Bombande’s from CJP, including professor Barry Hart and founding director John Paul Lederach. These trainings led, in 2002, to WANEP hosting the first official session of the West Africa Peacebuilding Institute (WAPI). Modeled after SPI, WAPI offered classes over a several-week period on a variety of conflict prevention and peacebuilding topics. 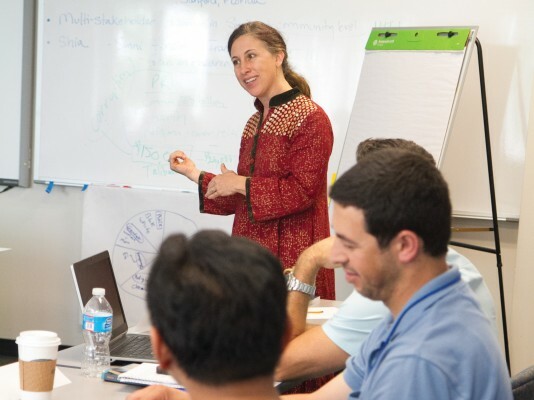 One of the teachers at the first WAPI was CJP research professor Lisa Schirch, who spent eight months in Ghana working with WANEP and developing the first training manual for its women’s group, WIPNET. (Current SPI director Bill Goldberg, who is married to Schirch, also worked with WANEP during that period.) CJP graduates Austin Onouha (from Nigeria), John Katunga Murhula (Kenya), and Gopar Tapkida (Nigeria) have all taught at WANEP. 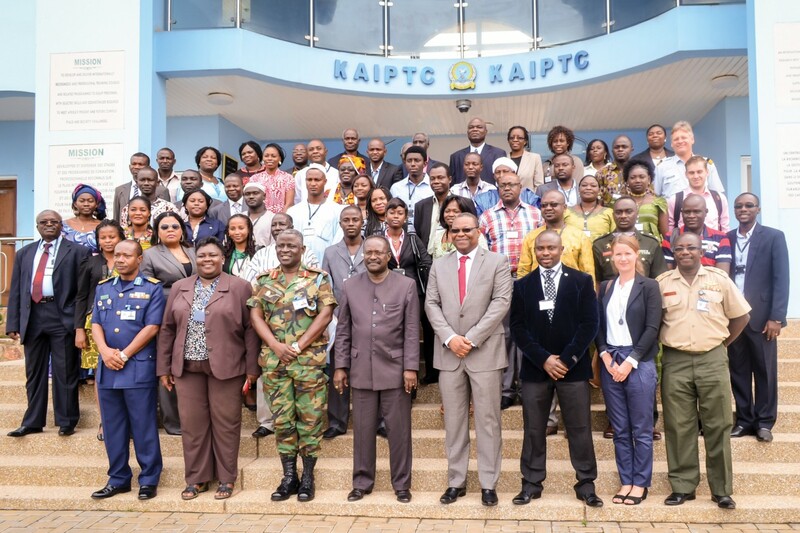 To date, more than 450 people have studied at WAPI – many of whom remain active participants in WANEP’s regional early warning network or other peacebuilding programs. WAPI has been held each year since 2002, with the exception of 2014, when the Ebola epidemic in West Africa prompted WANEP to postpone it until March 2015. Doe was WANEP’s first executive director, and served in that role until 2004, when he left to work for the United Nations. He now works for the United Nations Development Programme in New York City. Bombande became WANEP’s second executive director. In addition to coordinating ECOWARN and running the summer institute, WANEP supports over 500 member organizations in 15 countries, through its network of national offices in each country. It has an annual budget of $2 million (U.S.) and 22 employees at its headquarters in Ghana, plus 45 in its national-level offices. When “funding sources dried up in the informal spaces,” says Bombande – including the seed money provided by Mennonite Central Committee and grants from foundations – WANEP began to garner funding from European governments, including that of Austria, Sweden and Denmark. Governments want to be sure that they’re investing in a durable institution, one that uses certain mechanisms and procedures, says Bombande: “Governments want to look at your institutional systems much more closely than your programs.” This means that WANEP now needs staffers with the administrative skills necessary to run the institution in a manner that satisfies its backers and to issue the necessary reports, in addition to staffers with the skills to launch grassroots initiatives, as Doe and Bombande had when they began WANEP 16 years ago. 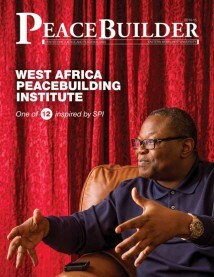 “I think it is time for a new generation to take it to the next level,” Bombande told Peacebuilder in late 2014. Within months, he had handed the reins of WANEP to Chukwuemeka Eze, who had been with the organization almost from the beginning and who proved himself capable of increasingly responsible roles. And Bombande moved temporarily to being a fellow at the Kroc Institute for International Peacebuilding at the University of Notre Dame in Indiana, joining for a while his old CJP mentor, John Paul Lederach. A few years ago, Bombande was feeling optimistic about the direction of West Africa: major advances in democratic governance were evident, and no civil wars had erupted since 2006, though there was post-election violence in Côte d’Ivoire in 2010-11. Providing for everyone’s “human security” is a standard that needs to be met by political leaders everywhere, rather than cultivating their own political base on narrow racial, ethnic or religious lines, which is a prescription for future violent conflict. Women are gradually assuming their rightful leadership roles in peacebuilding. WANEP’s second-in-charge is now a woman, program director Levina Addae-Mensah. Bombande recalls recently watching another confident, skillful woman, Edwige Mensah, running a WANEP training session in Dakar, Senegal, and thinking that she hardly resembled the shy young woman who had ventured into a WANEP office 10 years previously. The understanding of what it takes to rebuild a country after it has been torn by war must change. Too many governments and large international organizations think it is sufficient to support the holding of democratic elections and the training of police and military to “keep the peace,” as was done in Liberia. But peace in Liberia and elsewhere can only be sustained if poverty and injustices are addressed, education built up, and healthcare provided. In short, underlying socio-economic structural issues must be addressed, with international support. As the presidential election in Burkina Faso approaches on 11, 2015, there is still the potential for conflict.